Metrowest Ballet dancers perform in the Main Street Bank parking lot. 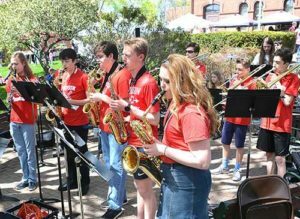 Photos/Ed Karvoski Jr.
Hudson – Several firsts were introduced May 5 when the newly-formed Hudson Downtown Business Improvement District (BID) hosted its inaugural ArtsFest Hudson in conjunction with the statewide ArtWeek initiative. While ArtWeek began in 2013 in Boston, this is the first year that the celebration of performance and visual arts expanded statewide to 155 communities with over 530 events. Additionally, Hudson formed the first BID in central Massachusetts. ArtsFest Hudson featured 12 performance acts of all ages. Dancers, instrumentalists, storytellers and vocalists entertained at two venues: outside the Town Hall and the Main Street Bank parking lot. 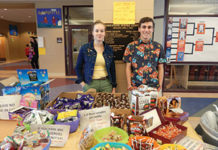 Over 50 artisans’ booths were stationed at those locations, as well as on sidewalks along Main Street, and outside the Unitarian Church of Marlborough and Hudson. Maps were distributed indicating downtown eateries and shops where festival-goers could visit during the five-hour event. Jesse Jewels belly dances outside the Town Hall. Photos/Ed Karvoski Jr. Among the performances were belly dancers previewing their 10th anniversary of “Bellies for Breasts.” The fundraiser benefitting breast cancer charities will take place Saturday, May 19, 1 to 5 p.m., in Union Hall at the Unitarian Church. 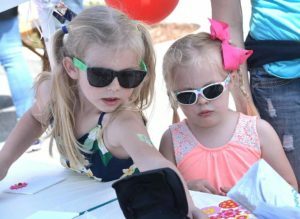 Festival-goers could draw designs on three 30-inch by 20-inch canvases provided by the downtown business Paint Misbehavin’. The finished artworks will be displayed in the Town Hall through Thursday, July 12, with the River’s Edge Arts Alliance’s “Art in the Hall” exhibit series. Meanwhile, children demonstrated their creativity with sidewalk chalk, crafts and bubbles. 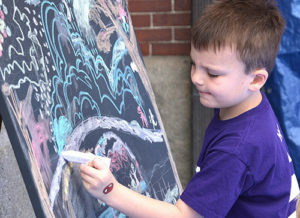 Andrew Murphy, 6, draws on a community art canvas. ArtsFest Hudson event chair was Debra Vanderwerf, who also serves as the BID cultural arts subcommittee chair. The district includes sections of Main, South and Washington streets, and parts of Main’s side streets. Selectmen unanimously approved creating the BID in November 2017. Tax surcharges are .035 percent on business properties and .02 percent on residential properties. Payments from participating property owners are expected to generate about $120,000 annually for various downtown improvements. 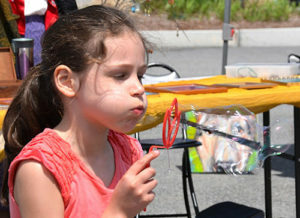 Maria Carrara, 8, blows bubbles in the Main Street Bank parking lot. Serving as district administrator is Richard Braga, retired Hudson police chief. The BID board chair is Arthur Redding, president of the Hudson Business Association and owner of Hudson Appliance. 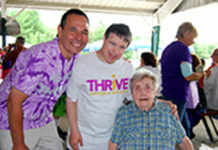 ArtsFest Hudson event sponsors were Create Honesty, Thomas Driscoll Piano Services, Puzzlescape, Rail Trail Flatbread Co., River’s Edge Arts Alliance and Serendipity. Serendipity owner Lori Burton has observed a productive evolution in downtown Hudson since opening her handmade jewelry and gift shop in 2005. 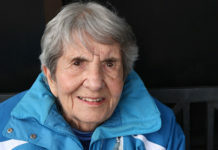 She foresees additional progress with the BID and is pleased with its first event. Hudson High School Jazz Ensemble performs outside the Town Hall. The Bauer sisters – Abigail, 5, and Lydia, 3 – create a craft. 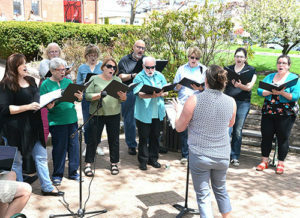 River’s Edge Chorale sings Broadway show tunes. Photos/Ed Karvoski Jr.